Having the best AAA flashlight as part of your everyday gear is a great idea. That way you never have to be stuck in the dark. 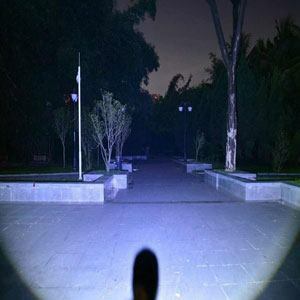 Whether you need it for work or not, using a flashlight to light up a dark alley, parking lot, or the deep woods gives you a big advantage over what might be lurking in the dark. Some AAA flashlights can be way too big, bulky, and have terrible battery life. There are some high performing flashlights out there that aren't too big, are bright, and have an excellent battery life. In this article, I did extensive research and rounded up the top 10 performing options for you. ﻿These flashlights are not only popular, but they also have the best specs and performance. 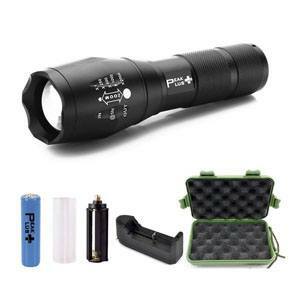 Whether you are going out camping, hunting, hiking, or the electricity simply goes out, a flashlight is a must have. That's why you want to make sure and get the right one. 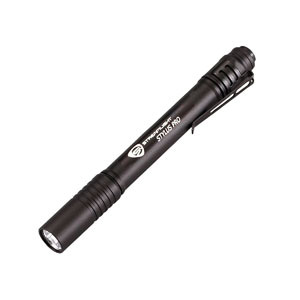 The Streamlight Stylus Pen Light is a high performer. It is small in size, 5.3 × 0.6 × 0.6 inches, and it weighs in at only 1.6 ounces. The pen style light fits perfectly in a pocket and comes with a tear-resistant holster. The aluminum body is water resistant and holds up great to corrosion. It has a scratch resistant lens that insures your light is clear and bright every time. The bright 90 Lumen LED will last you up to 30,000 hours of use. It runs on 2 AAA batteries. There is a black and red version that comes with a white LED, while the orange and green camo versions come with a green LED. Given all of the really awesome features, this one is the best AAA LED flashlight that you can get. The LE Adjustable Focus Mini Torch flashlight can be summed up as a high quality, inexpensive light. Along with its affordable price, the light only weighs 2.9 ounces and is 4.3 × 1.3 × 1.3 inches. It comes with three AAA batteries so you can power it up right out of the package. The sleek black look matches style with functionality. It has an adjustable focus that allows the light to be a tight spotlight for looking far away or a floodlight to light up a large, close area. The flashlight is bright, with over 140 lumens. Being waterproof makes it a great asset to have out in the woods. The OxyLED MD50 is another excellent option if you need something a bit bigger. Its dimensions are 2.1 × 8.3 × 4.7 inches. This light is heavier than the other lights weighing in at 6.5 ounces. It has a black color and comes with a battery charger for one 18650 battery, or you can run it off of three AAA batteries. The LED lifespan lasts over 50,000 hours with a strong 500 Lumen light output. This LED light has a zoom function and is water resistant. Its three brightness levels will meet your needs in many situations. The Streamlight MicroStream flashlight is tiny, but very powerful. For its size, the capabilities are amazing. With its 28 Lumens, the beam can reach a distance of 52 meters and has 30,000 hours of life. With the one included alkaline battery, the pen light will last for 2.25 hours. That makes this one the best single AAA flashlight around. Other amazing features of this light include its 1 meter impact resistance, scratch resistant lens, and water resistance. The aluminum alloy case is also corrosion resistant. The PeakPlus Outdoor Torch is yet another great choice with amazing capabilities. It weighs in at 5 ounces and is 5.3 × 1.6 × 1.1 inches. With just one 18650 battery or 3 AAA batteries, this light is small in size. 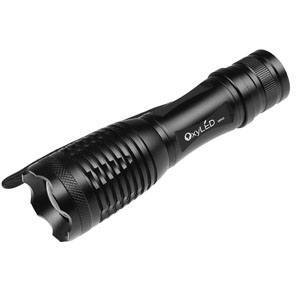 Its light range is 200 to 500 meters, and output is around 300 Lumens. This torch comes in a kit with the light, battery holder, battery sleeve, battery charger, 18650 battery, green case, and user manual. This light provides five modes—high, medium, low, strobe, and SOS. 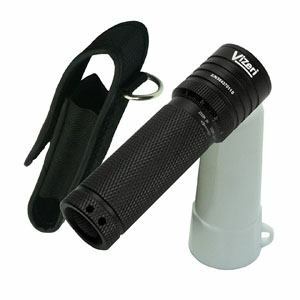 The Vizeri LED Tactical flashlight is another great one. Its dimensions are 1.3 × 1.1 × 4.25 inches with a weight of only 3.75 ounces. The flashlight comes with a lamp diffuser, which you put on the flashlight to create a lamp-like light. The light puts out about 230 Lumens of light. The holster allows the light to be hung and used as a lantern. This light also has five modes of operation. The flashlight remembers the last mode you used, which is very nice. 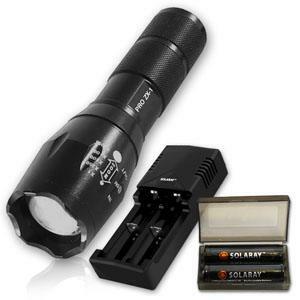 The Solaray Pro ZX-1 flashlight has it all. 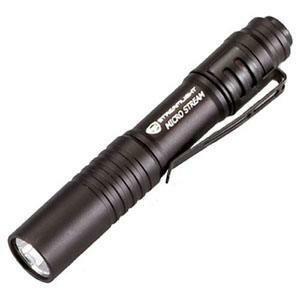 This black flashlight comes with a battery charger, rechargeable battery, and battery sleeve. 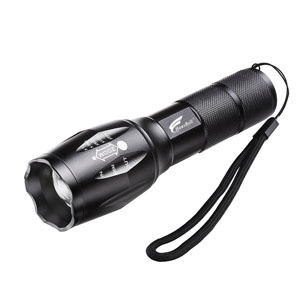 The light is about 1000 lumens, making it the brightest AAA flashlight in the list. It has five light modes. The zoom lens provides adjustable focus. As a bonus, the light comes in a padded gift box. The power of this light is amazing and the zooming capabilities are very smooth. Its dimensions are 6.2 × 1.1 × 1.5 inches. Made from aluminum, this light is water resistant and perfect for any camping or survival needs. The Hausbell T6 LED flashlight has a great price with amazing features. It is made from heavy duty metal and weighs 5.6 ounces. The dimensions are 3.7 × 1 × 1 inches, 3.6 volts, and 7 watts. This LED light has five modes: high, medium, low, strobe, and flashing SOS. The light also has a zoom function and is about 250 Lumens. 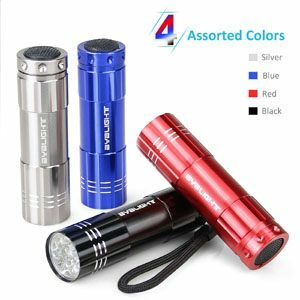 The BYB Super Bright flashlight, another price efficient light, comes in four different colors: silver, blue, red, and black. You get 4 flashlights in this set, making each one extremely cheap. 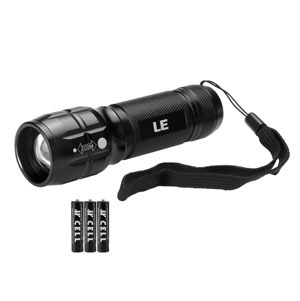 Its features include 30 lumens, an aluminum shell, a 20-foot beam distance, and each one runs on three AAA batteries. It has a tail switch and is very durable for its size. The light is small with dimensions of 3.2 × 0.9 × 0.9 inches and weighs only 3 ounces. If you are buying for the family or are on a tight budget, then you can’t go wrong with this one. 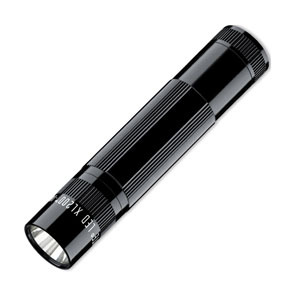 If you want to go with an established name brand, then the Maglite XL200 LED flashlight is definitely worth it. This light has four available colors: black, blue, grey, and red. Its features include five different modes including high power, strobe, night light, signal mode, and SOS. The light shines up to 138 meters and has 172 lumens that can run for 2.5 hours on 3 AAA batteries. The anodized aluminum interior and exterior resist corrosion. It also has an adjustable beam. When it comes to carrying a good flashlight on you, it just makes really good sense. Therefore, we need one that is compact, light weight, and great run time. 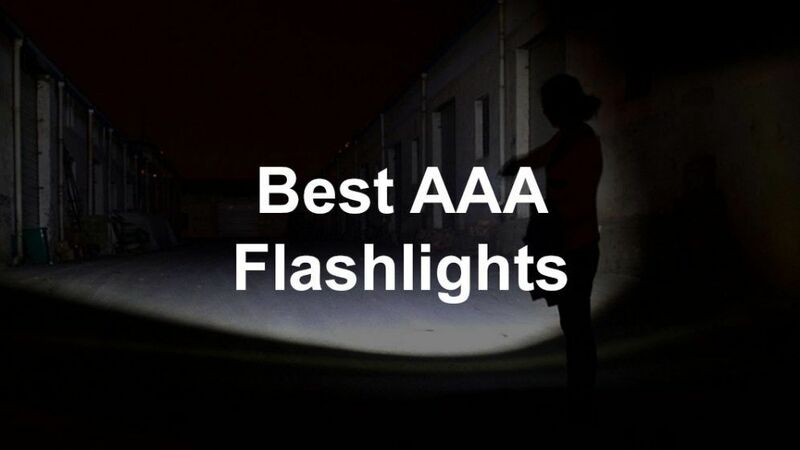 In this article, we looked at the top 10 options for AAA flashlights. All of these lights work extremely well and have great features. What is great about many of these is that they can run on either a rechargeable 18650 battery, or three AAA batteries. This gives you a lot of flexibility if situations get bad. If AAA is your preferred battery type, these flashlights will deliver great light from a very small package. If you want a flashlight that is more bullet proof, there is another option. Don't worry, if AA is your preference, I got you covered with this review. If you are looking for a flashlight that is even smaller, consider going with a keychain light. We put together a great review here.